This guide describes how to tailor the most important features in the user consent configuration for the Shibboleth Identity Provider (IdP) v3.x for deployments in the SWITCHaai federation. To learn about all possible configuration options, consult the IdPv3 user consent configuration reference in the Shibboleth Consortium Wiki. This guide is targeted at system administrators who are familiar with XML syntax. Note: For Shibboleth IdPv2.x installations, consult the uApprove documentation. sees the first time the attribute release consent dialog. The value my-terms-of-use is the key into the properties file that gets updated next. By introducing a separate .html property for the text really displayed to the user, you could fix typos and other minor glitches in the text without enforcing ToU re-approval for all users. To deliberately change the ToU version modify the text in .html and increase the version number in the .text property. Note: You can apply the above changes to your local.properties file, provided you adopted the optional configuration in section Messages Translations in the IdP installation guide. to display the contents of the .html property, now that the .text property is only used as key. 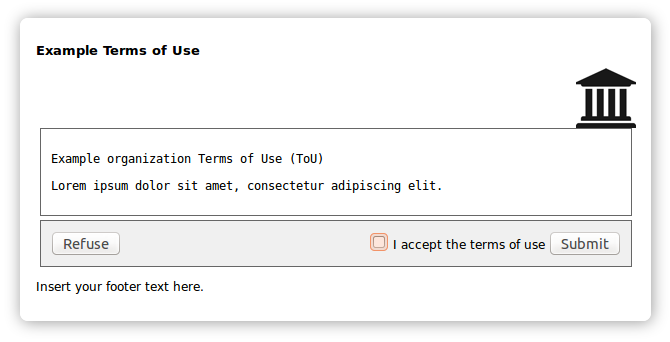 Add translations for the consent messages the same way as for other messages.properties files. In the Shibboleth Wiki you find translated consent-messages.properties files. Without an AttributeDisplayOrder list [feature introduced in IdPv3.2.1] defined in the file /opt/shibboleth-idp/conf/intercept/consent-intercept-config.xml, attributes get listed in alphabetical order of their IDs. Note: In IdPv3.2 the ordering could only be achieved with a whitelist. Since IdPv3.2.1, this is no longer necessary. Therefore, SWITCH recommends to configure an empty whitelist together with a catchall MatchExpression as in the consent-intercept-config.xml template provided by SWITCH. In case you would ever whitelist an attribute this catchall match expression prevents the IdP to treat all further attributes as they were blacklisted. Without the catchall match expression they would be released but not displayed on the consent screen. Since IdPv3.2, the SWITCH IdP installation guide includes a template that blacklists also the following three unique identifiers that usually have cryptic values. In the former default uApprove configuration for IdPv2, unique identifiers were already blacklisted. Further attributes can be listed in the file /opt/shibboleth-idp/conf/intercept/consent-intercept-config.xml in the bean configuration shibboleth.consent.attribute-release.BlacklistedAttributeIDs. SWITCH does not recommend to blacklist further attributes unless you have a very good reason to hide them from the users. Note: In IdPv3.2.0, for the blacklist to be effective, you needed to list these values also in the whitelist. That was fixed in IdPv3.2.1. It is possible to suppress the user consent dialog for SWITCHaai service providers operated by specific home organizations and/or types of home organizations. This option is provided for backwards compatibility with IdPv2's uApprove's services/services.blacklist settings, for sites wishing to retain the existing behavior. In general, SWITCH recommends using the IdPv3 default settings, i.e. enabling user consent for all SPs. Edit the file /opt/shibboleth-idp/conf/relying-party.xml and follow the instructions included in that file.